The German Marshall Fund hosted its annual Brussels Forum this week, convening leaders from North America and Europe to discuss the transatlantic community's most pressing issues. Washington Post Associate Editor David Ignatius moderated a discussion between US Trade Representative Michael Froman and European Commissioner for Trade Cecilia Malmström about the progress in TTIP negotiations. 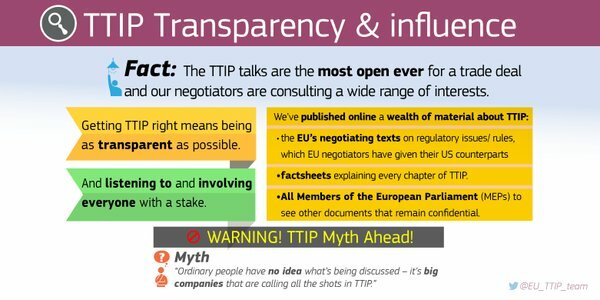 This week, the European Commission made public eight new TTIP text proposals as well as other negotiating documents. The publication of these documents is part of European Commission's ongoing commitment to transparency. Commissioner Malmström and Froman Meet again in Brussels to "Talk TTIP"
During their discussion at The German Marshall Fund’s "Brussels Forum", Commissioner Malmström explained how chapters in TTIP are nearly impossible to be completed individually because of the inter-connectedness of the entire agreement, which contributes to the seeming lack of progress - when, in fact, much progress has been made. When asked about the probability of the United States to make a deal with the United Kingdom should a Brexit occur, Ambassador Froman made clear that the United States focuses on multi-national trade agreements, not individual bilateral agreements. In addition, he believes the United Kingdom has a greater voice when they are part of a larger union. (German Marshall Fund) - Watch the whole discussion here. The Trans-Atlantic Business Council, in partnership with AmCham EU, released their annual transatlantic trade study this week. Despite continuing transatlantic economic turbulence, the United States and Europe remain each other’s most important markets: The transatlantic economy generates $5.5 trillion in total commercial sales a year and employs up to 15 million workers in mutually “on-shored” jobs on both sides of the Atlantic. The authors found that seven years after the 2008-9 financial crisis, the growth gap between the two sides of the transatlantic economy is narrowing, but gaps remain in trade, jobs, monetary policies and approaches to the digital economy.